First off, we LOVE this free-standing popsicle stick frame. I found the tutorial on the DIYfamily blog. 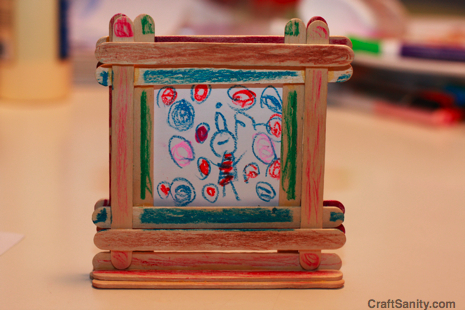 Abby drew a crayon drawing to put in the frame and then colored the frame with markers. These frames can be embellished with wood-burned text, paint or stain to celebrate Dad on Father’s Day. This frame is great because it’s designed to stand up on a desk or shelf. Download pdf instructions to make your own frame here. We like to bake, but you don’t have to to enjoy making these super fast Father’s Day cookies. We spread white Wilton ready-to-use cookie icing on vanilla wafers and animal crackers and let it harden for 45 minutes. (For best results, let the frosting harden overnight.) 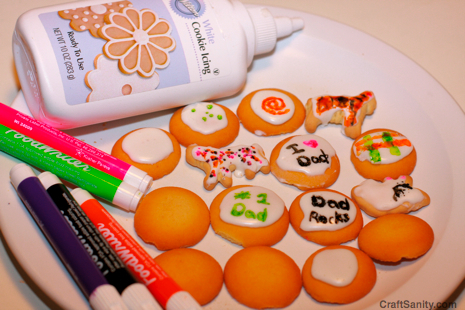 Then we used FoodWriter edible color markers to decorate the cookies with text and random designs. This last project is Amelia’s favorite. I was given a box of of business card size magnets a while back. You can use any business card sized magnet for this project. First cut a piece of paper the same size as the magnet. 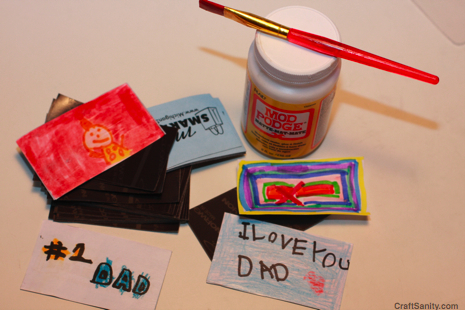 Draw a picture or write a message for Dad on the paper. Paint one coat of decoupage medium on the front of the magnet. Use it like paste to secure your artwork to the front of the magnet. Cover each magnet with two to three more coats of decoupage medium. Hello! I just would like to give an enormous thumbs up for the fantastic information you have got here on this post. I might be coming back to your weblog for much more soon. Pretty great post. I simply stumbled upon your blog and wanted to mention that I have really loved browsing your blog posts. After all I will be subscribing for your rss feed and I hope you write again very soon!